Section SR-7B includes six OA lodges that cover the eastern two-thirds of North Carolina. The following lodges make up the section: Tsoiotsi Tsogalii #70, Occoneechee #104, Croatan #117, Wahissa #118, Nayawin Rar #296 and Klahican #331. From North Carolina’s earliest area meeting in the 1940s to today the territory covered by these lodges has remained in the same section. 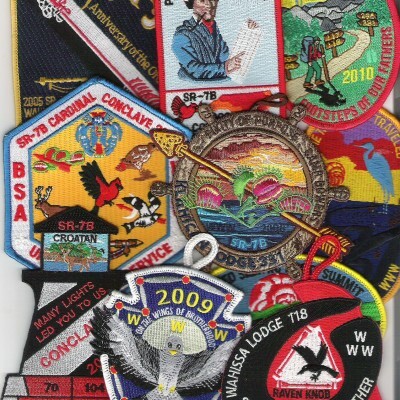 Through the years the section has added and lost a few lodges and had different designations. It went from Area I to Area 6A, Section SE-3A to SE-7, and from SR-7 to SR-7B. The section uses the name “Cardinal Conclave” for its big annual event. While the section has only six lodges it claims the designation of holding the nation’s largest conclave each April. In 2013 a total of 1,701 Arrowmen attended the section’s conclave at Camp Durant.